In my last article I introduced you to some of the basic facts about the new Premium Website features that will be launching in January. This week, I'm going to introduce you to another new feature. But first, I'll take a look at the pricing scheme for it, since I know that's on a lot of minds right now. Payment for a Premium subscription will be processed in two different ways. The first and preferred manner is over PayPal. If you have a PayPal account, or even just a credit card, you can pay for your subscription online. This will enable you to start taking advantage of the website features immediately, because it will cause an instant activation of your Premium account. You'll also be able to top up your account at any time, so that you don't have to worry about missing out on the features for any length of time. The second option will be to mail in a certified check or money order. In this case, you'll need to wait the requisite amount of time for it to be received and processed, but it allows you to keep your information offline if you prefer it that way. Here is the pricing scheme that we've come up with, which we hope everybody will find reasonable. As you can see, there's a 33% savings for signing up for 6 months at a time; or a 50% savings if you sign up for a year at a time. So, no real reason not to go ahead and get the full year! In addition, we'll be awarding some memberships to volunteers, as payment for their services. So if you don't have the money to purchase a membership, you can always try to earn one by writing articles for the website or finding other ways to contribute. Now, on to this week's new feature. ... One of the comments I'd made before was that "Everything a Premium member can get is also something a non-Premium member can get." This raised a few eyebrows and questions... like "What then is the point of a Premium membership other than being a way to financially support the CC?". Well, because the part of my quote that I left unsaid was that the version of things that the Premium members get access to is better than the standard version. For example, for a while now, everybody has been enjoying the downloadable box tops provided by Seth Claybrook. It's a great feature of the site to be able to print out your own .pdf of a beautiful box top design that Decipher hadn't originally produced. That way, you have a box for any affiliation you might want to play, from First or Second Edition. This feature will remain exactly as it is now, and totally free to all visitors to the website. But what if you want more than that? 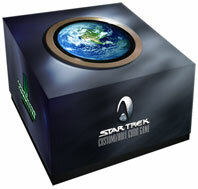 What if you'd like to create a customized 'Assimilate Homeworld' box top for your Borg Counterpart deck? 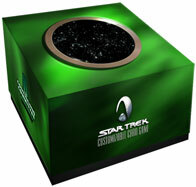 Or a special box top for your Romulan Neutral Zone deck? Maybe you're building a deck based around In a Mirror, Darkly, and want to show it off to your friends. 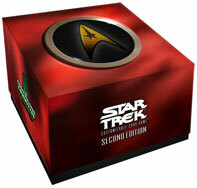 Or maybe you're just a fan of the original Redshirts and want to decorate your box appropriately. The possibilities are limited only by your own imagination! And best of all, once you've picked a design to slap together, you get a chance to customize it by adding your deck name and player name right on the side of the box. So, when you're at a big tournament and need to hand in your deck for deckchecks, there's no worry about it getting confused with anybody else's. The custom deckbox will make it easy to spot, and your name right on the side will make sure it doesn't get lost. Put it all together, and you'll be given your own custom .pdf to print out just as you did with all the pre-built ones. Want a more complete sneak peak at this new feature? Follow this link to the settings screen, and play away. You won't be able to produce any .pdf files until you get your Premium Membership, but you'll at least be able to start brainstorming for ideas on what kind of boxes you can make. Do you have one that you think is extremely creative? Email codemonkey@trekcc.org with the name of your deckbox and the three variables that you used to create it. I'll post the best 15 ideas on the forums. Everybody can vote for their favourites, and the winner will receive one month free of Premium access. Submissions are due by midnight server time on November 10th. Limit one entry per person. Let's see what you can come up with!